Batura Sar, also referred to as Batura I, is the 25th highest mountain on earth and the 12th highest in Pakistan. 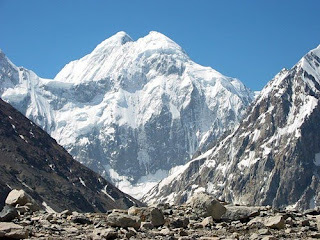 It is the highest peak of the Batura Muztagh, which is the westernmost subrange of the Karakoram range. It forms the apex of the Batura Wall, which is a continuously high part of the backbone of the Batura Muztagh. Alternate forms of the name of this peak are Batura, Batura I, and Batura I East. The height is also sometimes listed as 7785m, and the Western top of Batura I is of very similar height (often given as 7794m). Batura Sar and the Batura Wall lie near the middle of the Batura Muztagh, which is the only part of the Karakoram which is west of the Hunza River. The river curves around the southwest, west, and northwest sides of the Batura Muztagh. 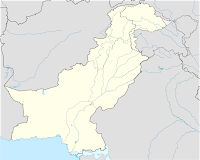 In turn, the Hunza Valley lies in the Gilgit District of the Northern Areas of Pakistan. In addition to being one of the highest mountains in the world, Batura Sar is also the second most prominent peak in the Karakoram range. Since it lies at the northwest end of the Karakoram, there is no higher peak north or west of it in the world. The Batura Wall is notable for being a long (approximately 10 km) and imposing ridge over 7000m. Batura is a very ridgelike peak, not a pointed spire. 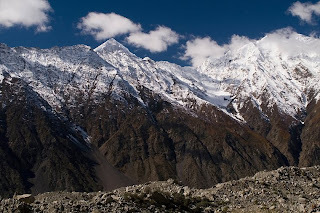 Although it is just slightly higher (according to the usual figures) than nearby Rakaposhi, it is not nearly as famous, since it is set back much further from the Hunza Valley. Climbing began in the Batura Muztagh later than in other parts of the Karakoram, and despite Batura Sar's height, it has seen little climbing activity.A climber named Matthias Rebitsch is recorded (by Neate) as having been in the icefall area (this is presumably the Batura First Ice Flow on the north side of the peak) in 1954. The peak was attempted in 1959 by three British and two German climbers, but they all died, probably in an avalanche. 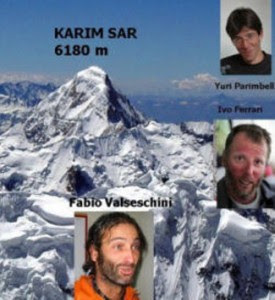 Some of the climbers may have gotten near the summit.The first ascent of the peak was in 1976 by the Göppingen Karakoram-Himalaya Expedition, led by Dr. Alexander Schlee. They placed their base camp on the Baltar Glacier, below the South Face of the peak, on May 21. Hubert Bleicher and Herbert Oberhofer reached the summit on June 30. The first ascent route climbed first from the Eastern Baltar Glacier up and over Batokshi Peak (called "Saddle Peak" by the first expedition) to Batokshi Pass (called the "Batura Saddle"). It then climbed diagonally up and northeast to East Ridge, and thence to the summit. The route used five camps above base camp. The second ascent of the peak was in 1983 by an Austrian group, who climbed a new route, to the left of the first ascent route.The Himalayan Index lists an ascent in 1984, but this is contradicted by Neate's book, so the status of this is unclear.The year 1988 saw the third or fourth ascent of Batura Sar, by another Polish-German expedition, led by Piotr Mlotecki. They used the first ascent route; however they failed in an additional goal of reaching Batura I West. The Himalayan Index lists five other failed attempts on the peak; these include a winter attempt by an Austrian group in 1981. However there seems to have been little or no activity on the north side of the mountain since the 1950s. The first ascent route is outlined above. The first ascent party reported ice up to 50 degrees, but they do not record the use of any extensive fixed ropes. They noted the weather and repeated storms as the primary difficulty. 2.Batura Mustagh (sketch map and pamphlet) by Jerzy Wala, 1988. 3.Orographical Sketch Map of the Karakoram by Jerzy Wala, 1990. Published by the Swiss Foundation for Alpine Research.